KALAMA, Wash. – Two police officers fatally shot a man suspected of killing a Cowlitz County sheriff’s deputy after he was seen running out of the woods with a firearm, ending a nearly daylong search, authorities said. It wasn’t immediately known whether the suspect, who hasn’t been identified, fired at the officers, Cowlitz County Sheriff Brad Thurman said late Sunday. The Clark County Major Crimes Unit and several other agencies are investigating the case, Clark County Sheriff’s Office Commander John Horch said. That includes evidence from a search warrant authorities served at a nearby residence after the shooting. The Daily News reported that the shooting was the first in-line-of-duty death in the agency’s history, which stretches back to the middle of the 19th century. DeRosier leaves a wife and a 5-month old daughter. He was a 2008 Kelso High School graduate and a deputy for the Cowlitz County Sheriff’s Office since 2016. He also was a criminal justice graduate of Washington State University. His grandmother, Darlene DeRosier, was a long-time Cowlitz County auditor. About 200 to 300 people, many of them connected to law enforcement, gathered at Martin Dock at Lake Sacajawea on Sunday evening to honor DeRosier. 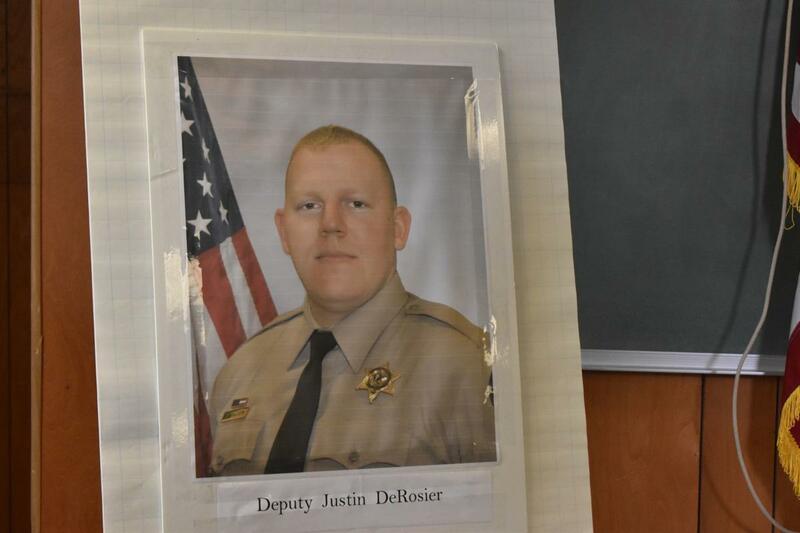 They sang “Amazing Grace” and remembered the deputy. The fatal shooting occurred less than a month after Kittitas County sheriff’s deputy Ryan Thompson was killed in the small town of Kittitas, east of Ellensburg, in a March 19 shootout. A Kittitas police officer was wounded while the suspect was killed. Spokesman-Review staff writer Jonathan Glover contributed to this report. Published: April 15, 2019, 8:12 a.m. Updated: April 15, 2019, 10:54 a.m.